Time flies when you’re having fun, and boy did Arayot have an amazing first session. The last week is finally upon us, and Arayot keeps bringing’ the heat, and the gold! 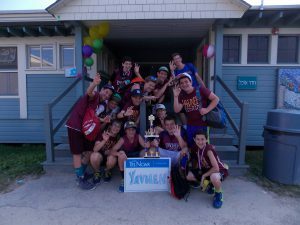 The JV boys’ basketball team, coached by Arayot madrichim (counselors) Ari Glasgow and Yoni Israel, trekked out to Camp Tel Noar for an inter-camp basketball tournament. Boy did they get buckets! With only 8 seconds left in the overtime game against Camp Young Judea, Arayot guard Noah L. blocked the game winning layup before outlining the ball to Arayot guard Benji H., who nailed a step-back 3-pointer to seal the game! Noah and Benji led the rest of the team to a 3rd place finish along with the sweet shooting of Sammy P. and leadership of Lance P., not to mention the superb rebounding of Ben I. and the towers of terror (Andrew and Brian). Benji and Noah also won all-tournament, all-star honors and Yavneh glory, as well! After starting their meltzer (waiter) training, the chanichim (campers) then served the whole camp on erev Estelle (Estelle night), honoring rosh agam (head of the waterfront) Estelle Gomolka for her 40 years of service and dedication to Machaneh Yavneh! 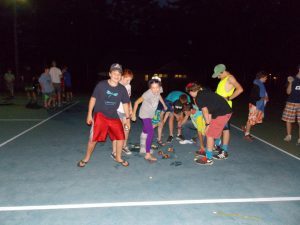 Following a wonderful feast and some cheerful singing and dancing, Arayot enjoyed an exciting peulat erev (evening activity), erev slow-no (slow-mo evening) where the chanichim engaged in numerous activities (basketball dunking, apple and orange smashing, balloon popping, singing, dancing, etc.) that were recorded in slow motion. It was a “smashing” success! Fast forward to Wednesday, a hectic, hilarious, hyped-up hump day. Going in and out of camp to practice for zimriyah, Arayot was able to head into the real world for a few hours to see Minions (which, oddly enough, is Arayot’s Zimriyah theme) before experiencing an active day full of basketball and slip n’ slide. Following a nice steak dinner, the tzrifim (bunks) were split up for their peulot erev. The banot (girls) had a powerful peulah full of bonding through breaking boundaries, which helped them come together even more before the session ends. B4 headed up to the new property that Yavneh has annexed, watching Cheaper by the Dozen in the new house as a reward for their tzrif being so clean. B9 had “Erev Horror” (horror night), where the madrichim transformed the tzrif into a haunted house for the chanichim to adventure through, telling scary stories with surprises and screams around every corner! Holy Haberdasheries! Can you believe that the day has finally come? It’s Zimriyah, Machaneh Yavneh’s heralded intra-camp singing festival! Arayot already had a head start on the rest of the machaneh, as they had plenty of practice performing one of their songs for the Ketsev performance last week. Already seen as early favorites, this talented bunch of rascals is set to take the scene by storm one final time before the session is over and bring home the glory! After all, THIS. IS. SPARTARAYOT.